IMPETUS analyses the information management needs of drone operations in very low-level (VLL) airspace. The project also proposes technologically and commercially feasible solutions to address those needs. IMPETUS contributes to the European framework dealing with the facilitation of the growth of the drone market, as a future generator of significant economic growth and societal benefits. The project is included in the first batch of drone-centric activities selected and funded by the SESAR Joint Undertaking to foster the development of the U-space system, which aims to enable complex drone operations with a high degree of automation in all types of operational environments. The solution developed in IMPETUS builds upon existing Traffic Management information systems addressing key issues such as data quality assurance, data integration needs with the Air Traffic Management (ATM) systems and scalability of the drone information services to multiple users with diverse business models. 1. Drone information lifecycle that best supports the flight lifecycle, with a view to defining a set of U-space services that leverage the data to provide the users with knowledge and wisdom, which will ultimately lead to safe and efficient operations. 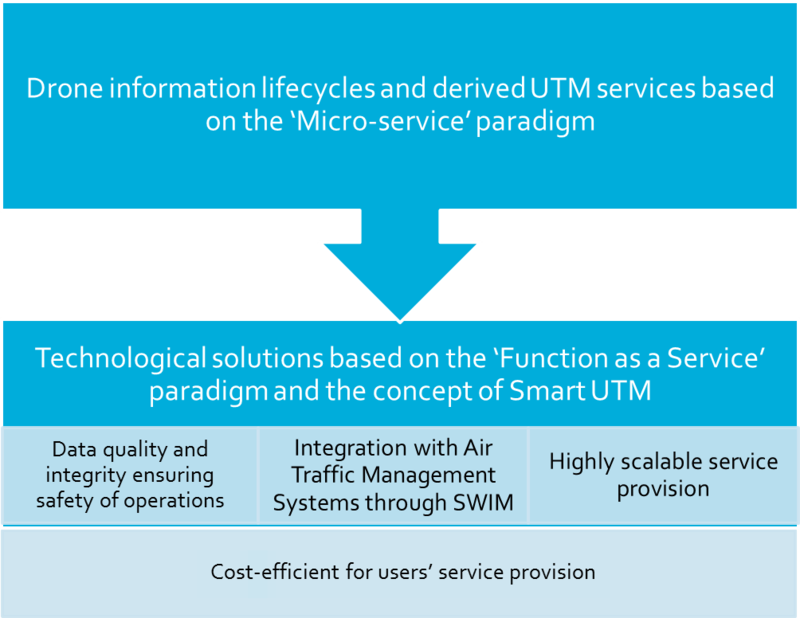 U-space services will be researched on the basis of the use of the ‘micro-services’ paradigm, aiming at exploring lightweight decoupled services, with a clearly defined functionality (focused on a specific capability) and simple interactions. These micro-services will be also characterized by the fact that they could be leveraged to build a more complex, modular composite service, and by allowing users to leverage information created by other users, e.g. services based on exploiting historical position data and sensor readings from a large number of missions to extract information that may be useful to enhance the safety or efficiency of future missions. To that aim, the project defines a set of flight lifecycles models (considering pre-flight, in-flight and post-flight) to describe the main types of drone operations in Very Low Level (VLL) airspace, focusing on operations without positive Air Traffic Control (ATC), including B-VLOS (Beyond Visual Line of Sight) and VFR (Visual Flight Rules) and considering the different types of vehicles and missions expected to be flown in this context. 2. Proposal for a technological solution to deliver the U-space services that should be characterized by its scalability to respond to multiple users with diverse business models, its mechanisms to assure the data quality and integrity, and its flexibility to facilitate the integration with manned traffic management systems. Solution will be researched on the basis of the cloud-based server-less computing, leveraging the ‘Function as a Service (FaaS)’ paradigm, which allows for highly scalable service provision at potentially much lower costs than standard cloud-based deployment. In the FaaS paradigm, the cloud provider manages the virtual machines necessary to implement the service request, which are billed according to a measure of the computing resources required to satisfy the request, rather than per virtual machine, per hour. Service providers and users will interact through a public portal, which will incorporate a market place to access services in different forms, e.g. applications, data, APIs (“API Store”), etc. IMPETUS also researches on the application of the Smart Concept to the design of the envisioned U-space system. The main driver of this concept is to ensure an optimum management of the U-space system with respect to measurable performance indicators relevant for the U-space such as costs, safety, security or scalability. This concept will be supported by emerging IT technologies to gather, curate, process and deliver data-driven services, including Big Data (BD) and Internet of Things (IoT). Special emphasis will be done on open source technologies provided that they are able to supply the required functionality. Among other challenges, IMPETUS will look into how these technologies allow fusing data from diverse sources of information on a massive scale to enable quality assurance centralized services to support safety, security and oversight. As an example, drones’ navigation and surveillance will require the integration of ADS-B or radar data with emerging approaches such as sensor-based navigation in GPS-denied environments. How the proposed solution can be connected to the European SWIM infrastructure is another objective of the project. The connection is envisaged as based on B2B services to leverage specific services and functions to authorized users and to take advantage of existing governance mechanism such as registry. This will allow providing a solution to the U-space that goes beyond current drone information services which are provided at local level, facilitating additional categorization and standardisation.